Aston Martin's Hybrid Hydrogen Rapide S, is a prototype race car capable of burning hydrogen, gasoline or a hydrogen-gasoline mix. Aston Martin set a small bit of motorsports history over the weekend by completing a fully hydrogen powered lap at the Nürburgring circuit in Germany. The lap was driven by Aston Martin Chief Executive Officer Dr Ulrich Bez at the wheel of the prototype Aston Martin Hybrid Hydrogen Rapide S, during the four-hour ADAC ACAS H&R-Cup VLN series race at the Nürburgring. It is the world's first hydrogen-fueled zero CO2 emission lap of the Nürburgring circuit in Germany. Aston Martin plans to race the Hybrid Hydrogen Rapide S in the upcoming ADAC Zurich 24 Hours of Nürburgring in Germany, which will make it the first hydrogen powered race car in a major international racing event. Dr Bez said: "I am incredibly proud of the Aston Martin team, and our partners Alset Global. We have written a little motorsport history with this qualifying lap as well as finishing the four hour race on hydrogen and, of course, it bodes extremely well for our participation in the 24 Hours of Nürburgring in three weeks' time. To have run full laps on hydrogen gas alone during the four-hour event is an exceptional 'first', and I now hope that we can stabilise the system and further improve the Rapide S so we can complete the 24-hour race on May 19 with many zero emission laps." One might hear "hydrogen race car" and think "fuel cell," and one might hear "run full laps on hydrogen" and think "zero emissions". However, neither is true. The Hybrid Hydrogen Rapide S is a prototype version of the Aston Martin Rapide S, that has been modified to burn either gasoline or hydrogen. It doesn't carry enough hydrogen for more than a few laps, and runs the rest of the race on gasoline. The hydrogen is carried in four ultra-high strength carbon fiber tanks containing 3.5kg (circa 7.7 lb) of hydrogen stored at a pressure of 350bar. Aston Martin's engineers have developed a prototype twin turbocharged 6.0-litre V12 engine which is capable of running on pure gasoline, pure gaseous hydrogen, or a blend of both. The system comprises a hydrogen fuel rail, storage tanks and proprietary engine management system. 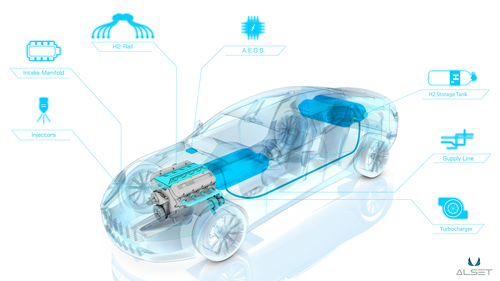 While running on pure hydrogen mode the car emits virtually only water from the exhaust. But, of course, while running on gasoline or a hydrogen gasoline blend, the exhaust is what is usually emitted from a gasoline engine. The whole system is built on the new 550bhp Rapide S four-door sports car, which goes on sale at Aston Martin showrooms across the Americas in the coming weeks. David King, Director of Special Projects at Aston Martin and the man leading the Hybrid Hydrogen Rapide S project, said: "This achievement should leave no one in any doubt that the system we have developed with Alset Global is a viable and exciting option for the future. "The creation of the Hybrid Hydrogen Rapide S was, for Aston Martin, another high profile way for us to mark our centenary in 2013, and to demonstrate our engineering capabilities in the most demanding environment of a major endurance race. This is the ultimate expression of our long term strategy of using the Nürburgring 24 hour race to publicly demonstrate the abilities of our cars and our people."